*Wyndham Bonnet Creek Resort* lets guests escape the familiar and experience a truly wonderful vacation! This resort provides a rainbow of exciting possibilities to set you free and make it easy to have fun. You'll find yourself just minutes from the gates of the world's most magical theme parks, and your stylish resort home comes with a swimming pool and lazy river, a wading pool with interactive water features, and an outdoor hot tub, all very relaxing. Also enjoy a stroll along the lakeside boardwalk! For more information about this resort, visit www.clubwyndham.com. *RCI Gold Crown Rated / The Registry Collection Affiliated* Featuring finely appointed floating accommodations. Annual usage is based on points, with 105,000 points per year included in the sale. 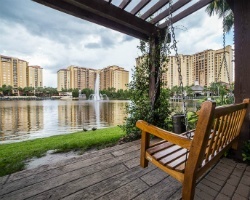 Points can be used at this stunning Lake Buena Vista resort or any resort in the Wyndham network. For more information or to make an offer, please submit the inquiry form.